Photos via (Clockwise from left) DoodleCraft, Inspired by Charm and Landee See Landee Do. Looking for an inexpensive way to add a little pizazz to your nursery design? You won’t believe what a difference an ordinary can of spray paint can make! Add a touch of bold color, or glam up your baby’s space with gleaming gold accents. The possibilities are endless! Need a little inspiration? Make one of these 10 easy spray paint ideas your next nursery project. Photo via Inspired by Charm. 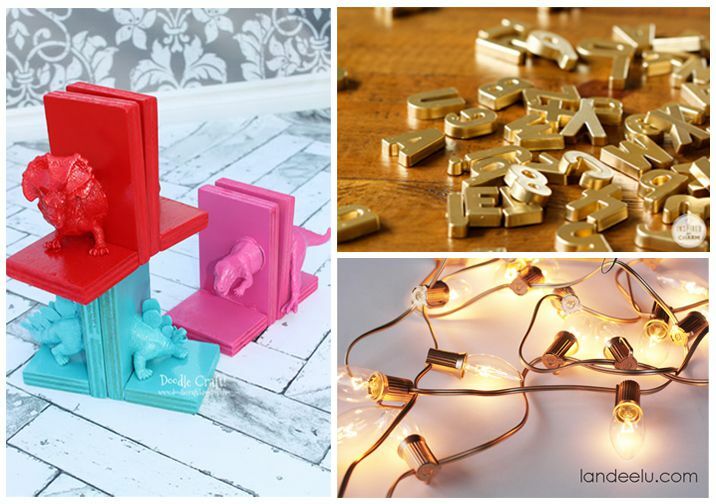 Give a cheap set of alphabet magnets a chic, new shine with a quick coat of metallic gold spray paint. Don’t forget to prime your plastic letters first! Update a second-hand chandelier with a bright and modern hue. Photo via Fawn Over Baby. Love the eclectic look? Create a stylish, mix-and-match gallery wall for less. All you need is a handful of thrift-store frames and the unifying power of spray paint. Look for frames of all different shapes, sizes, and styles. The more varied your choices, the more striking their effect will be. Once you’ve made your selection, prime your pieces and paint them a single shade. The common element of color will ​tie your mismatched pieces together, creating one cohesive set. Want a chic look for less? Give an old-fashioned nursery lamp a polished-porcelain look with a quick spray of glossy white. A little color can add a lot of style. Spray painted a sunny yellow, this beautiful crib just beams with energy, bringing life and focus to the space. Learn how to transform cheap toys into sophisticated accent pieces. Turn a set of old mason jars into a useful collection of colorful friends. All you need is a few animal pals and some superglue. Just mount and spray! Dollar store dinosaurs make for fabulous shelf décor in this easy-to-recreate spray paint project. Ready and roaring to make your own? Get the details over at DoodleCraft. Fairy lights bring a sense of whimsy to any space, but a nice set can be pretty costly. Need a budget-friendly solution? Use gold spray paint to transform an ugly set of oversized, holiday lights into something altogether more charming. Photo via The Little Umbrella. Create nursery storage that really shines by spraying cheap, wire baskets with gold spray paint. Craving a little color? Try a bold shade of glossy red or orange.